Hi friends! After years and years of wanting to stop wearing glasses and contacts, I finally got LASIK and it FEELS AMAZING! There are two main reasons why I decided to finally get LASIK. The first reason was that I hate wearing glasses (they’re hard to hike/work out in and are always sliding down my nose) and I also hate wearing contacts (my eyes get really dry and irritated). And yes, I’ve tried all sorts of different brands of contacts and they are all the same. The second reason was that during my Europe trip I almost lost my glasses looking over the Liffey River in Ireland and that was terrifying. I started to think about what would happen if I lost my glasses (and my eyesight essentially) in another country and that was the last straw. Check out this video which kind of gives a visual of my experience and then read the rest of the blog post (because that is where the full details are). And if you make it to the end of this blog post, you can learn how you can get 15% off of your LASIK eye surgery if you decide to do it! 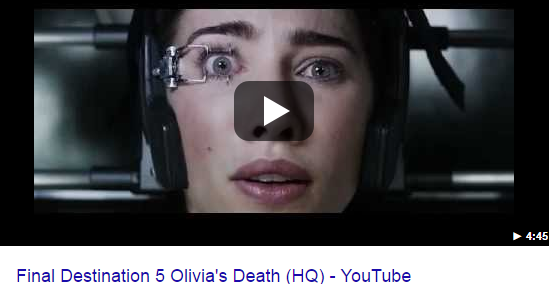 Trust me when I say that I was nervous to get this procedure done especially after watching Final Destination 5 (lol). But that video is so unrealistic…first of all she’s wearing make up. You are not allowed to wear make up to get LASIK. Don’t watch it if you are planning on getting LASIK, it’s not a pleasant video. But anyway, I really wanted to get rid of my glasses/contacts. I was afraid of the procedure, so I did what any logical person would do who was afraid. I researched and I got informed. The first thing I did was look into several places in the valley that performed LASIK operations. I looked at their reviews and the place that really stood out for me was LasikPlus, so I decided to go in for a free consultation. Right off the bat, the staff at LasikPlus was SO friendly and welcoming. I walked in, they did a few tests (typical tests that you get done when you are getting glasses/contacts) plus a few other tests to determine if I was a candidate for LASIK. I learned a lot during my consultation. Not everyone is a candidate for LASIK. This is why it’s important to go in for a consultation. Wearing contacts changes the shape of your eye! I had no idea. They tell you this little fun fact because if you are going to get LASIK done, they ask you to not wear contacts for at least three days because contacts distort the shape of your eye, and they can’t operate on a misshapen eye. I loved LasikPlus because they give you a wealth of information in person, through a video, and then they give you some reading material. I walked out with all of this information and I was so ready for LASIK. Nervous but ready. After you schedule your operation, the doctor gives you a prescription for two different kinds of eye drops that you will have to use after you surgery. These eye drops are basically used so that your eyes don’t get infected. I was kind of busy the week leading up to my surgery so I didn’t get the eye drops before when I should have and this came back later to haunt me. As I mentioned before, I was very nervous to get LASIK done. And a skill that I’ve developed as an engineer is that when I am nervous about something, in order to get over those nerves I like to get more informed about whatever it is that is making me nervous. So I googled. And I YouTubed. And I read. A LOT. I googled what exactly happens when you get LASIK. I googled what happens after you get LASIK. I YouTubed videos of people getting LASIK and I YouTubed videos of people talking about LASIK. I also read a ton of articles and googled a ton of weird questions like ‘what happens if you sneeze during LASIK?’. The answer is nothing. Nothing happens because your doctor holds your head so there’s no way your head will move. I also talked about LASIK with my friends and one thing that was surprising to me was that when I posted on my personal facebook page that I was getting LASIK, a ton of my friends reached out to me and gave me more information. It was surprising for me to see how many of my friends had already gone through this procedure. All of this research calmed me down and prepared me for what was to come and that’s probably the biggest thing that helped me out. So if you are anything like me, I’d like to congratulate you for reading this blog post. You are well on your way to getting informed and that is the first step. I’ll post a link to the best video and article that helped me out at the end so that you can check them out. The Day of The Operation! The day of the operation, I woke up, did some work on my computer, drove to the pharmacy to give them my prescription (they tell me to come back after my operation to pick up the eye drops) and then I drive over to my brother’s house because you need someone to drive you after your operation. My brother drives me to LasikPlus and it’s time. The staff was so friendly and so excited for me. Like genuinely excited. It was really heartwarming how excited they were for me (and that’s another reason why I recommend them).I filled out some more paperwork, paid (I’ll talk about cost a little later), and then went through a few more tests (just to make sure my eyesight hadn’t changed drastically since my initial consultation). Everything looked good and I was ready to go. I meet Dr. Perry (who is my new favorite person in the world) and he walks me into the operating room. The operating room at LasikPlus is really cool. What I liked about the operating room was that the walls were made of glass so your family members could watch to make sure that you were okay. And taking advantage of the glass walls, I asked my brother to record a little bit of the procedure. Dr. Perry gives me a cap to wear and puts some numbing drops into my eyes so that I won’t feel anything and tells me to lay down on a reclining chair. Normally I would have freaked out over the numbing drops but they put these same numbing drops into your eyes during your consultation so you know what to expect and what it will feel like. It basically just makes you blink a lot less and your eyes feel really heavy. Once my eyes are numb, Dr. Perry takes a marker and makes some markings on my eyes. It felt weird but since my eyes were numb, it kind of just felt like when you touch your eye to put on your contacts. The entire time Dr. Perry is super calming and making me laugh (which I really needed because I was so nervous that I thought I was going to pass out or throw up). I lay down and he starts explaining what is going to happen. As he is starting to perform the operation, I relax a little because after reading and watching videos about LASIK I kind of know what the next steps are. This calms me down. So I am laying down and he starts working on my right eye. He puts a patch over the left eye. He tells me he is going to clamp my right eye open so that he can work on it. This was my least favorite part during the procedure. But luckily my eye is numb and I feel no pain, just a little discomfort. The clamp basically looks like a bear claw trap (or an eyelash curler) and it is used to keep your eye open. Dr. Perry is really fast and I barely feel the clamp. He then says he’s going to add ‘suction’ and for a second I didn’t know what he meant and then I remembered because my vision turned black. He had placed a suction ring over my eye to hold my eye still. He then brings over the machine and from my perspective I just see black, some red lights and a green dot. The black is from the suction ring, the red is the laser and the green is just a dot to focus on. He tells me to focus on the green dot and that I will feel a little pressure. I feel the pressure on my eye, kind of like a pen on my eye and it is so weird…but it’s not painful. I am focusing on the green dot and he tells me it will only last 22 seconds. I count to 22 in my head and that helps me relax and not freak out. He finishes and then does the same thing to the other eye. Once that is done, Dr. Perry moves me over to another chair for the second part of the operation. The first part of the operation is cutting a flap in my eye. The 2nd part of the operation is when the laser comes in and when the doctor pulls the flap back down. I lay down and I can feel a few tears sliding down my cheek (but again, no pain…I can’t stress enough that there was no pain). He tells me again to focus on the green dot and this time I can smell the laser. And it smells like something is burning (which is totally normal, the staff told me this would happen and Google/YouTube confirmed) and then Dr. Perry grabs an instrument and starts brushing my eye to put the flap back. It felt really weird. I can feel him stroking my eye kind of like he’s petting a dog (lol) but then he’s done! That’s it. He did the same thing to the other eye and then I was good to go. The operation literally lasted less than 3 minutes and I can tell you it was less than 3 minutes because during the operation I could hear Jason Derulo’s song ‘If It Ain’t Love’ playing in the background. Based on the information that I got from the staff at LasikPlus, Google, YouTube, and friends I was told that immediately after the operation my vision would look like if I was underwater (a bit hazy) which it did but that it would be greatly improved from before! My vision was really sharp in some places and blurry in others but I COULD SEE. It was unreal. Dr. Perry looked at my eyes through one of his tools and he gave me the okay to leave telling me that all looked great. He also told me that he was looking forward to seeing what I would write in my blog so I hope he likes this post (Hi Dr. Perry!). Dr. Perry and his staff tell me to go home and rest my eyes for 1-2 hours and then to begin putting in the eye drops. I read online that you should go immediately home after LASIK and not make any pit stops but my brother wanted to go eat at Olive Garden and I thought I would be okay because at that point the numbing eye drops hadn’t worn off and I felt great! About 10 minutes later though, my eyes were no longer numb and there was no way I would be able to make it to Olive Garden. As I keep mentioning through this post, there was no pain…just some discomfort but the reason I didn’t want to go to Olive Garden was because my eyes were tearing up. It looked like I was crying. And not cute little tears….more like a waterfall was coming out of both of my eyes. And it only stopped when I closed my eyes. So we decided to head straight to the pharmacy and then home. We went through the drive thru at the pharmacy because I was still tearing up. I had to open my eyes (which opened the flood gates) in order to find my card in my wallet and I kid you not, I felt like I was drunk because I couldn’t see ANYTHING. There were just too many tears. We finally get home and at this point, my eyes are super dry and irritated and I just want to lay down and close my eyes. However, you have to put in two different eye-drops before you rest your eyes. I could barely open my eyes and hold the eye drops at the same time so my brother had to do it for me. Once the eye drops were in, I felt immediately better. I love modern day medicine and technology. I took a 2 hour nap and woke up with PERFECT VISION. It was amazing but so weird at the same time. I kept reaching for my glasses because I was just used to grabbing them right when I woke up but I didn’t need them anymore! Another reason why I absolutely loved LasikPlus was that at around 8pm, Dr. Perry called me to check in on me! Who does that?! How sweet is that!! He also asked me if I had posted the video and blog post. He’s hilarious. And don’t think this is just a one time thoughtful thing. After my consultation, another doctor mentioned that if I were to ever need anything now or 10 years from now, to reach out to him. That’s probably one of the sweetest things I’ve ever heard in my life. 1. I put on the eye drops right before I went to bed and when I woke up, I tasted something really weird and bitter. I thought maybe the eye drops had slid down my eyes into my mouth. When I went for my check up I was told that it is normal to get a taste of eye drops in your mouth because the tear ducts that drain tears will also drain some from the eye drops down your throat. Which is kind of gross when you think about it. 2. I also learned that it’s normal to get a headache and feel like your eyes are bruised. I thought my head ache after the surgery was because I was hungry (I didn’t eat before the surgery because I was so nervous I was afraid I would throw it up) but it’s really because your eyes are seeing a lot and your brain kind of needs to catch up. 3. I learned that you shouldn’t drink alcohol a day before your operation, the day of your operation and the day after your operation. I learned this while at lunch with my brother and mom after my check up. I ordered a glass of wine and my mom asked me ‘Are you sure you can drink?’. I googled and I found out that you shouldn’t drink because alcohol makes your eyes dry and you will feel even more discomfort and dryness. My brother had to drink my wine and he doesn’t even like wine, it was sad. A few days after the operation! I will start off by saying that getting LASIK has been one of the best decisions of my life. I’ve lived a pretty good life and gone on some great adventures and had some great experiences but there is no better feeling than waking up and being able to see without the help of glasses and contacts. It feels unreal. I love that my life is now in HD. I see in High Definition. I wish I had done this earlier. Waking up with great vision is like when you are spending the night at a friend’s house and you kind of have to do a double take and think to yourself ‘that’s right, I’m not at my house’ or ‘that’s right, I can see now’. The worse part about recovering is the fact that I will randomly taste the really gross eye drops and that I can’t rub my eyes (for a week) but that’s it. Just minor nuisances but I’m so happy I went through with it. I absolutely love this and highly recommend it to anyone. The procedure literally takes less than three minutes, you only need about 1 night and the next day to recover and then you’re brand new. One thing that holds a lot of people back (including myself for a while) is the cost of LASIK. 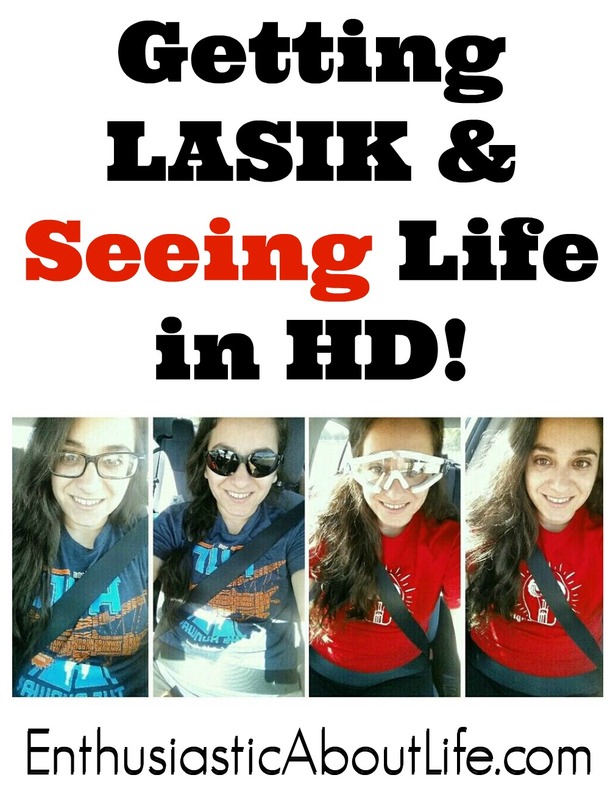 I really hope the video and this blog post help you out and if you do decide to go and get LASIK done, feel free to message me or comment below if you have any questions! I’m here to help. If you tell LasikPlus that I referred you, they will send me some cash but I’m not in it for the cash. I just want to share my experience and if that motivates you then that’s great. And just to show that I’m not all about the cash, if you tell them I referred you (you get 15% off) and I get cash, and we will use that cash to celebrate your recovery by going to a bucket list restaurant. Good luck friends! Let me know if you have any questions in the comments below 🙂 thanks for reading and stay enthusiastic! < Previous The Ultimate ‘Treat Yo Self’ 5K Race! Next > Peach Pickin’ at Schnepf Farms! Congrats on the 20/15 vision! Lasik is definitely on my bucket list and I love that described your experience in detail. I’ve been thinking about it for a while now and cost has always been a deciding factor for me. Nice to know this doctor allows for that. 😁 I’m going to have to do it soon!!! I just want to tell you that I am new to blogging and truly enjoyed you’re blog. Likely I’m going to bookmark your site . You definitely have very good articles and reviews. Bless you for revealing your blog site.